The Key to all of the fishing right know is access. The box is no exception. You would be wise to leave the boat at home. If you’re planning on a trip to fish the box canyon here is what you will need. 4.A change of dry clothes to change into. 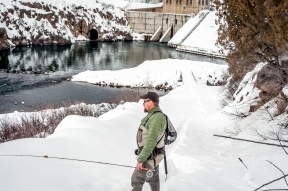 Again access will be the main challenge on the lower Henry’s Fork. The ramps are not maintained in the winter so getting boats in and out can be the toughest part of the day. It can be done with a considerable amount of work. Also keep in mind there is a lot of ice in the river that could pose some danger. If you have to float I would consider a pontoon boat or raft. When temps are up and wind is minimal the midge fishing has been good. As we head into February I am hopeful that things will warm up and the midge hatches improve. A #18 Griffith Gnat will get the job done for you on the surface. 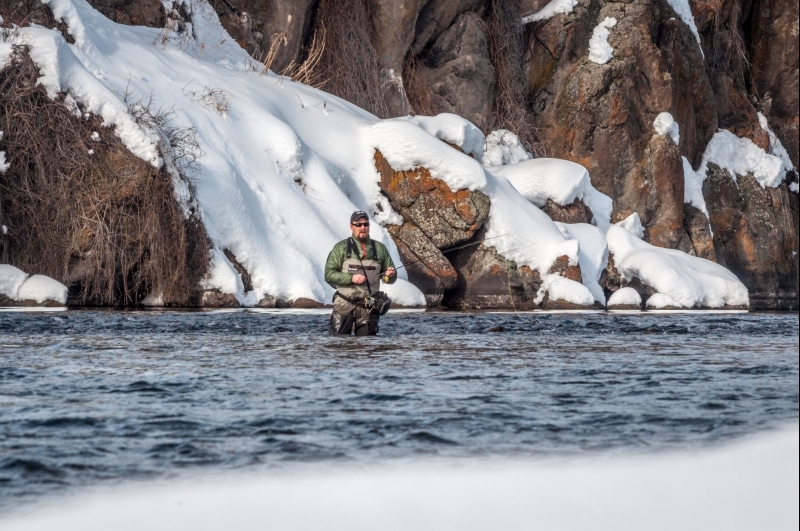 Focus your dry fly fishing in the back waters and pools of the river. Streamer patterns will also serve you well on the lower Henry’s Fork. The story on the South Fork is much the same. Lots of slush ice and access is a challenge. Never fear however February usually offers a reprieve. I know for one I am suffering from a severe case of cabin fever so I can’t wait for some warmer temps! If you get a decent day then look for Midges. Rubber Legs and small Zebra Midges will work for you on the South Fork.